Being in nature occupies kids: As we drove to the state park, I wondered what we would do for fun and how we would keep the kids entertained. Much of my job is consumed in this endeavor on a daily basis, and trust me, it is no small task. However, I was delighted to find out that just being around some trees, sand and dirt provided most of the entertainment needed, particularly for Ellie, who spent much of the time pretending to be or do something outlandish and extravagant while we put up tents and cooked food. Camping is cheap: This should be number one, but I'm trying to get away from that thinking... 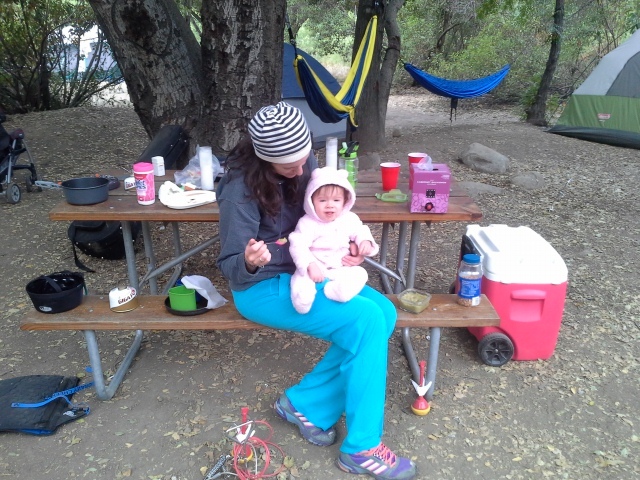 Camping is super cheap for a family. You bring your own food most of the time, and renting a camping spot can be as low as $15/night (if not lower), which is what it was this time. Compare that to a hotel or taking the family to Disneyland, and you will always come out on top. Exploring as a family is fun: Katie picked a great spot, right at the back of the lot with plenty of woods to gather fire fuel from. Right away Ellie kept asking, "Daddy, can we go exploring now?" in a cute little way that only a kid could manage. It was the first night and getting dark, and I hadn't caught the lay of the land myself yet, so I assured her we would explore the next day. We ended up going on a family hike and it was a great experience; educational, fun with a little drama for good measure (some mud we had to traverse). We grew as individuals and together, I think, and so I recommend adding this to your list of things to do while camping. Baby wipes are crucial: An excellent clean-all for dirty hands and sticky s'more faces alike. You can also toss them into the fire to keep them out of the trash. Prepare for cold nights: Make sure you have a good tent, good sleeping bag and maybe a mat/air mattress for some underneath insulation -- especially for the kids. The last two camping trips I've taken featured colder nights than we expected (though we were better prepared for this most recent one). You don't want those kiddos catching a cold. Go with the flow: We forgot to bring phone chargers and both of our phones were dying on the way. Dependent on GPS apps, we nearly became lost and weren't sure how we would get home at the end of the trip. We ended up making it there fine, but about half an hour into the camping, Waverly was crawling around the inside of our car and locked the doors. Unknowingly, Katie got her out and shut them with the keys inside... Thankfully, I had enough battery to call AAA and get us back into our vehicle, where we still had a bunch of supplies stored. It was a little stressful, but something about the quiet of nature beckons you to let annoyances blow away with the wind and simply exist. This really was one of the quietest places I had ever been, particularly at night. You could hear a breeze swelling through the trees before it got to you, as well as the snoring from the tent across the way on your midnight walk to the bathroom. Nature isn't always convenient or easy, but there is a reason it draws us in: we grow, bind with others, recenter ourselves and see God's work. I have many more stories from our short two-day trip, but for now I will just write that you should probably go outside more often, and spend the night out there if you have any interest in doing so. You won't regret it. I wrote last week about the magic of climbing trees. Well, there is a dark side to every forest, a shadow to the sunshine, and in that tree I found it: poison ivy. The rash showed up a couple days later, but a surf swell hit and so I went to the beach, hoping a dip in the ocean might bring some saline healing that I have experienced time and time again. The water didn't work though, and the rash only spread. That night I woke up at 2:30 in the morning, unable to sleep and fishing for a cure. I remembered we had Benadryl, so I lathered up. I also searched the internet for any remedy I could access at such an hour. Apple cider vinegar, baking soda and an oatmeal bath were what I came up with, and so I added to my chemical doctoring some natural cures. I didn't really want to draw a bath that late however, so I just made a cup of oatmeal and slapped it on my wrists. So why am I writing this? 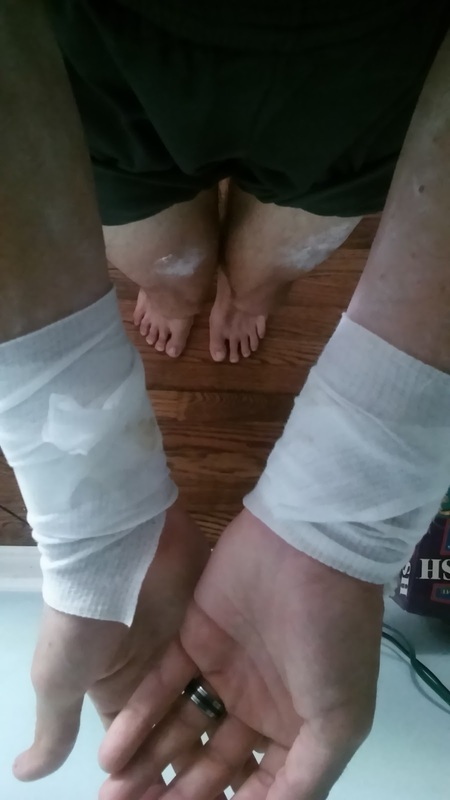 Partially to share some remedies that worked for me (calamine lotion has also helped a lot), but partially because I am in pain! Sharing my story helps me process I guess...I don't remember the last time I was this uncomfortable, and I feel like I can now sort of sympathize with folks suffering from any topical ailments. It reminds me of all those bible stories about lepers, and brings to mind the severity of what life would be like so isolated. Of course my problem is nothing like that, and will likely pass in a couple more days, but the thought is still there. Anyway, I guess what I am writing is that this is terrible -- I wouldn't wish it on anyone -- the other side of the coin to the childlike fun of climbing trees; so maybe there is a reason we quit doing it all those years ago. Climbing still has to be worth it, and we must always stay in touch with our child-nature, but maybe next time I will be more careful. When was the last time you climbed a good tree? If you're like me, it's probably been awhile. But remember how fun it was? How many memories do you have trying to get to the top, swinging on branches or maybe falling and breaking an arm? 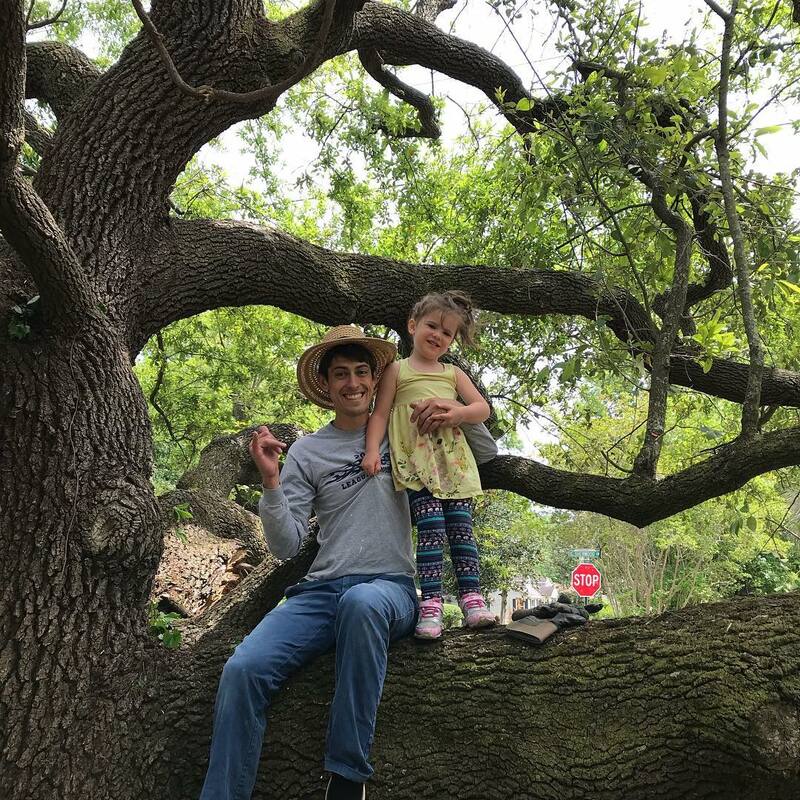 It's all part of childhood and trees must be one of the greatest gifts from God, for much more than just practical reasons like fruit and air filtration. There is an awesome climbing tree in front of the house we rent, which was my grandfather's while I was growing up. Over the years, it has become quite overgrown with vines and bushes, so naturally I haven't climbed it in a while. Well, a few weeks ago my family came over to overhaul the yard, and before I knew it I was pulling down vines (many of which were grape vines...there goes my vineyard plans) and cutting bushes like an outback tour guide. But the tree is tall and the vines have been growing thick for years, so to get them all I had to climb up with an axe and clear away in the safest -- but still dangerous -- way I could! The next generation of tree climbers! And suddenly I remembered: climbing trees is awesome! It was so fun seeing how high I could go (I made it equal with the power lines); something about the element of danger mixed with nature is so magical. So I want to encourage you to go climb a tree! And take your kids with you! One day all these trees may be artificial/digital arborish air filtration systems, so we better do it while we can! A friend at work a few years ago, in a moment of vulnerability, told me he didn't have much confidence in life, which consequently did not help with the difficult women in and around Los Angeles. Feeling that I myself have spent most of my life without much confidence, I felt a bit at a loss as to what I should say. I vowed to him that I would research the topic and get back to him -- this is what I found. There are two things I feel pretty confident in: writing and music. I asked myself why and there are two reasons I've come up with: I have done them a lot, and people have told me I am good at them. I think experience most definitely plays a big part in confidence, but I think it's pertinent to focus on the latter reason -- affirmation. Confidence is a social concept. Sure, you can be confident at woodworking or making Excel spreadsheets or other potentially solitary endeavors; but I think confidence in the most widely used sense has a connotation of performance. And in that way, a large part of confidence must be imparted from someone else. I can play drums with strangers on stage and feel relatively comfortable because several people have told me I am a good drummer. I am happy to share this blog because many people have told me I am a good writer and it has benefitted them. I feel confident in these two tasks because others told me I am capable and competent in them, and somewhere along the line I started believing them. So whose job is it to tell us we're good at things? Our family's? Friends'? Facebook or YouTube's? And is it okay to depend on others for that confidence? I struggle with this because I have really taken hold of those two areas of my life with said confidence, knowing the reasons behind it. And yet, I know that my confidence and affirmation are supposed to come from God, not from people. So why do I look to others to build my confidence, and if I find it there, is it okay to go along with it? I remember watching the Olympics a couple years ago and some high-divers did really well. In their after-interviews, they told the news that their coach continually reminded them that, no matter how they performed, their identity was in Christ. Consequently, they were able to perform quite well, the heavy weight of purpose in performance having been lifted before they dove. It was a powerful statement and certainly pertinent to our personal and professional lives. I think finding confidence in others can be beneficial, but a more powerful and farther lasting source is in Christ. People are fleeting and some may affirm you while others, even those you respect, may do the opposite. However, a God who does not change and has given you a word, personally and/or through the bible, is a far more worthy confidant, and will take you through heftier trials as they come.